Summer vacations are just around the corner. Did you know that drive vacations account for 91% of all summer travel? Time to get you and your car ready for the road, so we've put together our favorite tips and tricks for memorable road trips. Tip #1, Plan your Route - your road trip may be a destination – beaches, mountains or lakes – or a journey, where the journey itself is the vacation. Decide which you'd enjoy most and plan accordingly. There are many good travel blogs and websites that map out popular trips using the most scenic routes. Tip #2, What to See? - Trip planning is easier now than it’s ever been. AAA will still build you a Triptik with routes and destinations, but TripAdvisor and other apps now offer easy advice. Of course Google Maps and Waze help with traffic and navigation. Be sure to bring a phone holder for hands-free driving (if you don't have bluetooth in your vehicle as many states now require it) and a USB charger for your car if it’s not part of your car’s equipment or you anticipate needing additional charging ports for family members. Tip #3, Stops & Breaks – especially when traveling with kids, plan to stop every few hours. Not just for pit stops, but taking time to see even a brief Sidelight will make your trip far more enjoyable and interesting. And you can post photos for friends and family along the way! Tip #4, Naps - (no, not for the driver). Be prepared by bringing travel pillows and travel sized blankets for passengers. Traveling alone? Bring them for you - but please find a safe location to stop. It's better to take 15 minutes to rest and refresh than driving in a half sleep state. Tip #5, Entertainment – kid's need fun activities every day - the car is no exception. There are lots of good organizers for kids on-the-go. A tablet holder that doubles as a seatback protector is a great idea - it keeps tablets safe and at a comfortable viewing distance. But don’t forget old favorite non-board games like 20 Questions, Ghost, and License Plates – keeping eyes focused out can keep car sickness at bay. Tip #6, Snacks - you’ll want to have a stash of your favorite munchies. Healthy finger foods like bite-size grapes, nuts and raisins are good and unmessy choices. You’ll probably want a cooler for drinks. Plastic ones can take a lot of space. Hanging coolers like this one keep drinks within reach without taking up seat or floor space. Tip #7, Trash - snacks often lead to trash. Whether fast food or orange peels, you’ll need a place to put it. Choose a leakproof car trash bin to contain spills. A covered trash bin is also a good option to control both the trash and it's odor. Tip #8, Pit Stops – pack biodegradable wipes, tissues and sanitizer in a place within easy reach. You never know where you'll be when Mother Nature calls. Tip #9, Be Flexible - don't overbook with too many things to do in too little time. Relax. Take your time and be prepared for detours and distractions. Remember that it’s as much about the journey as the destination. Some of your most memorable experiences will be those you didn’t plan. Tip #10, Make a Road Trip Playlist - put a list of your favorite travel songs on a playlist. Traveling with kids? Be sure to mix up the mix - listening to Disney movie scores the entire trip can be mind numbing. 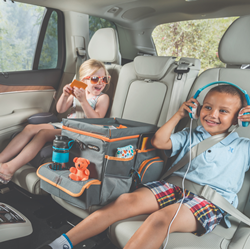 Let the kids know in advance that the driver gets to hear their fave songs too for the most enjoyable trip for all.